Fast Heat-up: 25 seconds fast heat-up, 1500W powerful steam penetrates deep your clothes, consistently to remove stubborn wrinkles. Safety Protection: A safety automatic power off protection when the water lever runs too low or the unit gets overheat. Safe to be used on all delicate fabrics. Convenient To Use: 3oz/90ml removable water tank supports 4-6 minutes continuous steaming. With removable attachments, fabric brush, creaser, soft cushion brush, heating plate, measuring cup and travel bag are included. Portable To Carry: The garment steamer can be compactly stored in your suitcase and comes in handy for freshening clothes while traveling or daily use at home. Hassle-free Warranty: 1-year warranty is offered to our customers. If for any reason you are not satisfied with your purchase, email us for any query and we will be in touch within 24 hours. Replacement or refund will be provided for your preference. Powerful 1500 watts heating system and heats up incredibly fast, in less than 25 seconds. 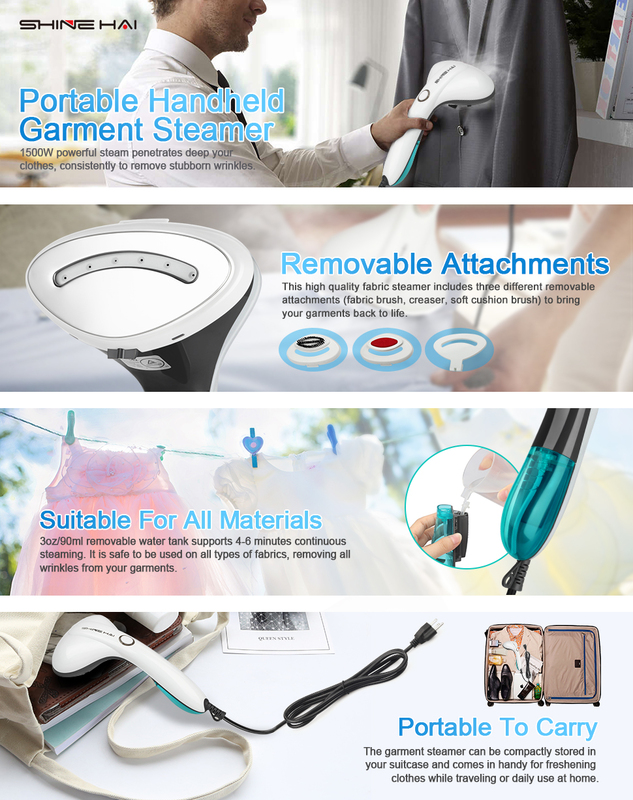 Produces a powerful and consistent steam, removing all wrinkles from your garments, upholstery, drapery, bedding, table linens and more, without the hassle of using an iron and ironing board. The 3oz/90ml removable water tank is easy-to-fill and locks into the steamer. It is lightweight and ergonomically designed with a 7.2foot power cord for easy maneuverability. It is safe to be used on all types of fabrics. This high-quality fabric steamer is perfect for handling all types of fabrics, linens and drapes. It includes three different removable attachments (fabric brush, creaser, soft cushion brush) to bring your garments back to life. Also, includes a measuring cup and carry bag, convenient for use, storage and travel carry.